Like the Schedule K-1s that befuddles many investors at tax time, incentive distribution rights (IDR) are a subject that investor relations employees are likely tired of discussing. It’s axiomatic that generous IDRs siphon cash away from MLPs. Accordingly, the market tends tend to discount MLPs with lofty IDR obligations, and reward partnerships that lack these cumbersome agreements. Consider the two largest MLPs by market capitalization: Enterprise Products Partners LP (NYSE: EPD) and Kinder Morgan Energy Partners LP (NYSE: KMP). Enterprise Products Partners eliminated its IDR obligations after acquiring its general partner in November 2010. Kinder Morgan Energy Partners, in contrast, pays out the highest proportion (45.9 percent) of its distributable cash flow to its general partner, Kinder Morgan Inc. (NYSE: KMI) of any energy-focused MLP. 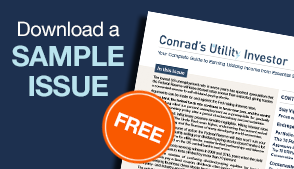 Energy & Income Advisor subscribers should check out Elliott’ Gue’s exclusive report that analyzes the IDR obligations of all 50 names in the Alerian MLP Index. Not a subscriber? 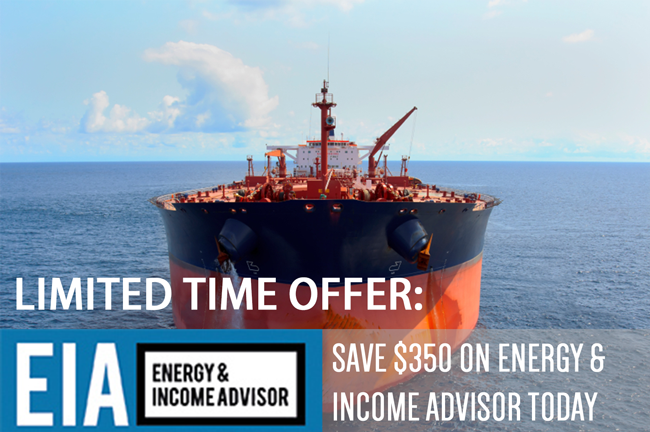 Sign up for a risk-free trial today and save up to $350 dollars. Since subsuming its general partner in fall 2010, Enterprise Products Partners has grown its quarterly distribution by a total of 21.9 percent; Kinder Morgan Energy Partners grew its payout by 24.3 percent over the same period. And over the past 12 months, Kinder Morgan Energy Partners has grown its distribution by 20 basis points more than Enterprise Products Partners. Despite its IDR obligations, Kinder Morgan Energy Partners has increased its payout at a faster rate–in part because the MLP runs a much tighter distribution coverage ratio than Enterprise Products Partners, which routinely retains cash flow for reinvestment. 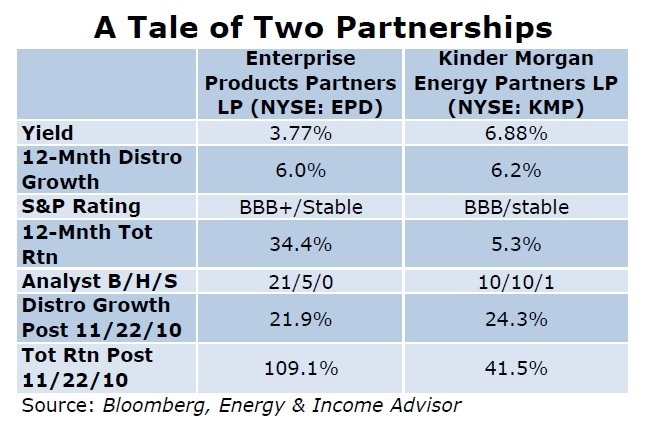 A superior margin of distribution safety, integrated asset base and prescient management team have enabled Enterprise Products Partners to more than double the total return posted by Kinder Morgan Energy Partners since Nov. 22, 2010. And this divergence has widened over the past 12 months, with units of Enterprise Products Partners gaining 34.4 percent and Kinder Morgan Energy Partners returning a paltry 5.3 percent. Enterprise Products Partners has delivered the yield compression (price appreciation that outstrips distribution growth), while Kinder Morgan Energy Partners offers a significantly higher yield. Nevertheless, Kinder Morgan Energy Partners has consistently delivered superior distribution growth to Enterprise Products Partners over the period in question–an impressive feat when you consider the cash flow diverted by its IDRs. As for business quality, both partnerships are extraordinarily diversified and large enough to compete for any midstream project. Both have limited exposure to fluctuations in commodity prices and rely heavily on fee-based businesses and long-run contracts. Both also have powerful balance sheets and solid credit ratings. To be sure, Kinder Morgan Energy Partners has been hindered by Hedgeye Risk Management’s dubious attacks on the MLP in Barron’s, an investment publication that’s popular among retail investors. Hedgeye Risk Management charged that Kinder Morgan Energy Partners downplays its exposure to commodity prices and underfunds its maintenance capital expenditures to pay bloated incentive distributions to its general partner. Kinder Morgan Energy Partners chased off the bears by posting solid first-quarter results that served as a reminder of the strength of its gas-related infrastructure. Nevertheless, the stock’s current valuation doesn’t reflect the levers that the MLP can pull to unlock value for unitholders. And if Kinder Morgan Energy Partners’ units were to appreciate to levels that would close the yield gap with Enterprise Products Partners, the stock would fetch more than $146 per unit. 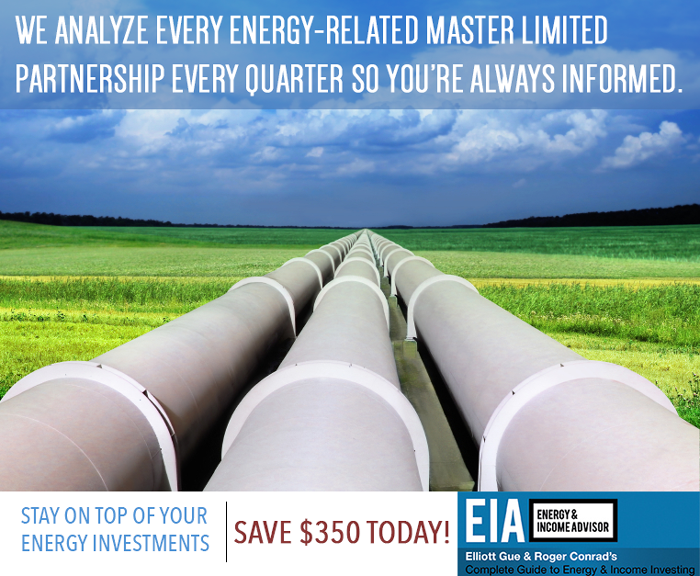 Although we don’t expect this differential to close any time soon, Kinder Morgan Energy Partners still trades at a discount to Enterprise Products Partners and other large-cap MLPs such as Energy Transfer Partners LP (NYSE: ETP), Williams Partners LP (NYSE: WPZ) and Plains All American Pipeline LP (NYSE: PAA). This discrepancy may not make much sense. But it’s still a good reason to speculate that Kinder Morgan Energy Partners might at least consider buying out its general partner. Founder and CEO Richard Kinder owns 23.65 percent of Kinder Morgan Inc., so any move on this front would have to go through him. 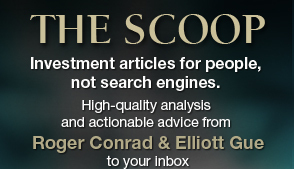 But the mere threat should dissuade investors from shorting the stock. In the meantime, other MLPs have taken action to limit the negative effect IDRs have on their unit prices, with the goal of cutting their cost of equity capital. Canadian energy giant Enbridge (TSX: ENB, NYSE: ENB) announced plans to modify Enbridge Energy Partners LP’s (NYSE: EEP) partnership agreement and restructure its IDRs. This move comes as part of the general partner’s long-run plan to fund its own growth projects by dropping down its US midstream assets to the MLP. Enbridge will exchange its IDRs for Class D units and new “incentive distribution units” (IDU) in Enbridge Energy Partners. These new unit classes will guarantee Enbridge roughly the same distribution as its former IDRs; the difference is in the impact on future distribution growth. Enbridge currently receives about 50 percent of any incremental distribution that Enbridge Energy Partners pays above $0.495 per unit. In contrast, the IDUs and Class D units will reduce Enbridge’s cut of any incremental distribution growth to 25 percent of all payouts above $0.5435 per unit. The effects of this restructuring on Enbridge Energy Partners’ cash available for distribution isn’t as dramatic it would be if the MLP bought out its general partner. However, such a transaction was out of the question. Not only does Enbridge’s market capitalization of US$39.4 billion dwarf that of Enbridge Energy Partners, but the Canadian energy giant also owns numerous operating assets in North America. When a number of MLPs took out their sponsors in 2009 and 2010, the majority of these transactions involved names that were pure-play general partners and didn’t own any operating assets. Given Enbridge’s plan to drop down much of its US liquids pipelines to Enbridge Energy Partners, a total buyout of its general-partner interest would be impractical and ill-advised. In effect, the restructuring reduces Enbridge’s share of Enbridge Energy Partners’ distributable cash flow, effectively cutting the partnership’s cost of equity capital. This strategy of enlightened self-interest will grow the overall income pie in the long run much faster than the previous arrangement, enriching the general partner far more than taking a larger percentage now. For investors in Enbridge Energy Partners, it’s the best of all possible worlds. The market’s immediate reaction to the deal was positive, though overblown concerns about possible dilution from the Class D units have tempered this enthusiasm somewhat. 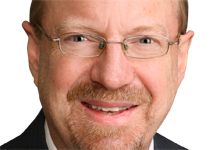 In a conference call to discuss the restructuring, management reaffirmed its goal of growing the distribution by 2 percent to 5 percent this year–likely at the high end of this guidance. As we saw with the 67 percent gain posted by Buckeye Partners LP (NYSE: BPL) last year, a return to reliable distribution growth after a fallow period can send an MLP’s unit price higher in a hurry.